Caesars Slots brings a taste of Las Vegas to Aussies with the help of exciting pokies and other types of casino games along with the joy of tons of bonuses. Launched in 2012, Caesars Slots has already gotten plenty of experience in the social gaming space. By teaming up with the famous software giant, Playtika, Caesars Slots is able to offer top of the range games to Aussies looking for a fantastic social experience on Facebook, the standalone site or apps. It's apparent that they've taken a page or two from Las Vegas casinos, drawing inspiration from the famous Caesars Palace as they've created their own version of the gambling capital of the world in the social space. There are several ways to connect with Caesars Slots. You can go to the website and login with a Facebook account, or register with an email. There's also an option to go directly to Facebook and play from there. That's something that over 6 million people seem to have done. Or, if you prefer to play on your mobile device, you can do that, too. Caesars Slots has option on all the major mobile platforms, plus they have cross play so your coins will come with you whether you play on desktop or mobile, or both. Speaking of coins, it's important to point out that Caesars Slots has an excellent series of promotional offers. You will get a ton of coins just for signing up, and by following Caesars Slots on Facebook and Twitter, you can get even more. Plus, there are regular promotions and events to help players get even more bonus coins. We all know that Australians love their pokies, so it should come as no surprise that Caesars Slots has exactly what Aussies are looking for! The app lobby presents slots directly and it's possible to check out even more games by clicking through the more buttons. There are tons of games available, and more free slots are added frequently. However, it's important to note that Caesars Slots does something that is very common with social casinos and isn't always fun for players. They will give you a free game or two when you sign up, but you will need to level up in order to access more games. You level up by logging in and playing regularly. It's still totally free for players, but it can be frustrating if you want to access a specific game and need to play other games for several days before you can get to the one you actually want. It shouldn't come as a surprise to anyone that the demand for mobile casinos is ever increasing. People love their smartphones, and many of us feel naked without it. Whether you use yours to keep track of your bank balance, message friends, scroll through social media or shop online, we are all accustomed to being able to do whatever we want, wherever we want, whenever we want. And why shouldn't that include playing our favourite mobile pokies? Caesars Slots has excellent mobile application integration, making the apps easily available to players across a range of devices. The Caesars Slots Mobile Casino works for users on Android, Apple, Windows and even Kindle devices. 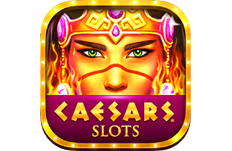 You can find the links through the Facebook page for the Caesars Slots, or else through the usual app store for your smartphone or tablet. All the apps are fully secure so your data is safe, plus they are free and only take a few seconds to install. Thanks to Playtika's software, almost all the games from the social casino work just as well on mobile devices. The lobby even looks the same so you won't miss any opportunities to play when you choose to do so from your smartphone. Plus, having the same account on different devices means that you can conveniently switch from phone to computer as you see fit. So whether you want to get a few quick games in while waiting for a friend or you just relax on the couch and unwind with your favourite pokies, you can do it all from the comfort of your smartphone or tablet. Caesars Slots is only available in English. This won't be a problem for Aussies, of course, but even if you have friends from other countries or who speak other languages, you can still play together because the controls are intuitive and easy to enjoy without being fluent. Customer support is available after login on the website where you can send an email. However, most questions are already answered in the thorough FAQ sections provided by Caesars Slots. Alternatively, they have a fantastic community management team, so you can always pop them a message on Facebook or leave a comment on one of their posts. Caesars Slots is a safe choice for Aussies looking to get their fill of pokies and Las Vegas-style excitement. With a vibrant online community, it's action city at Caesars Slots, with tons of casino games to play in a social setting. You may need to play for a while to unlock a specific game you're looking for, but who knows, you might discover new pokies to love along the journey. With millions of fans from around the world, Caesars Slots has already established itself as a major player in the social casino space. Thanks to fantastic Facebook integration, you can play in your browser, on your desktop or even on a mobile app without losing your progress or coins. Plus, Caesars Slots simply has a wonderful collection of the latest pokies and games. All of this combines to make it easy to recommend the social casino experience through Caesars Slots. Play at Caesars Slots Casino and Get Your Free Chips Offer Now!